I used to work with Sandra from Flossie FT, she would ping me on the communicator to let me know that she had something new on that she’d just finished and I’d rush upstairs to “Oooh” and “Ahhh” at her latest creation. 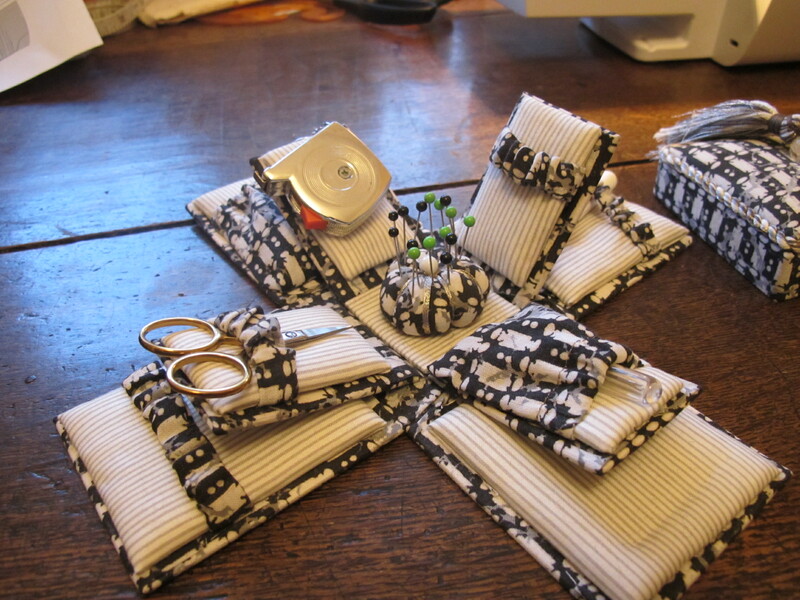 I started following her blog and then others from the Wellington Sewing Bloggers Network and she encouraged me to start my own and join their Gang. Really it’s a bit dangerous knowing this lot, they encourage stash acquisition, eating and cocktails. All things I’m rather good at on my ownsome without extra encouraging. 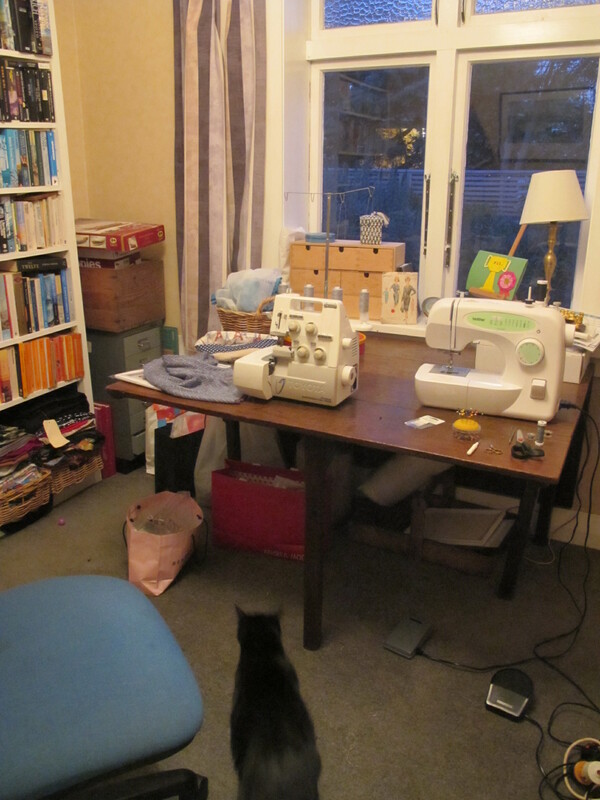 To get out of the winter doldrums Gemma from 66 Stitches suggested “The Great WSBN sewing room tour” a blog tour featuring our sewing spaces, so you get to see my Sewing/Office/Room-o-crap in all it’s glory. 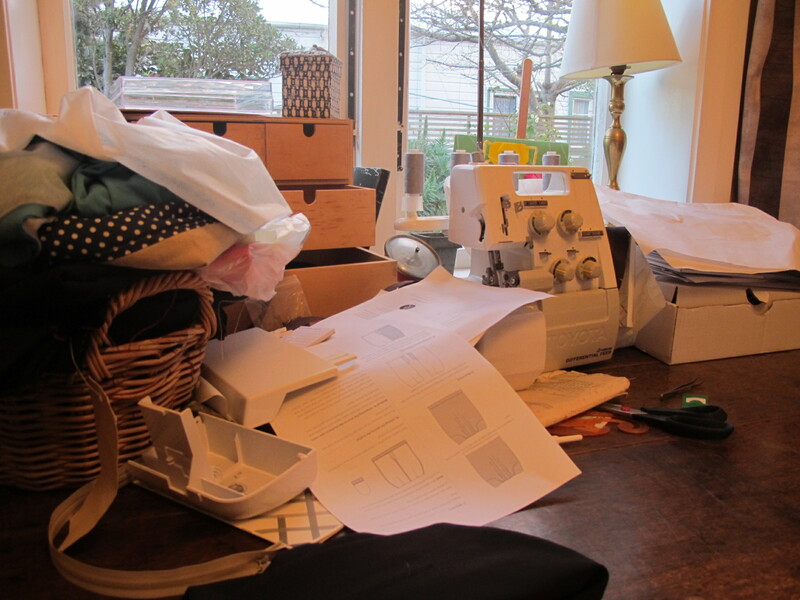 The idea was to show the places from which our creativity flows, and normally mine is a truly glorious mess however about two weeks ago we had a friend to stay the night so I had to clean up to fit in the blow up bed….. ooooh Sewing/Office/Guest/Room-o-crap! Front and center is the table, at the moment it’s primary purpose is my sewing table, but my husband makes wooden model ships so it does transform at times into a tiny shipyard instead. 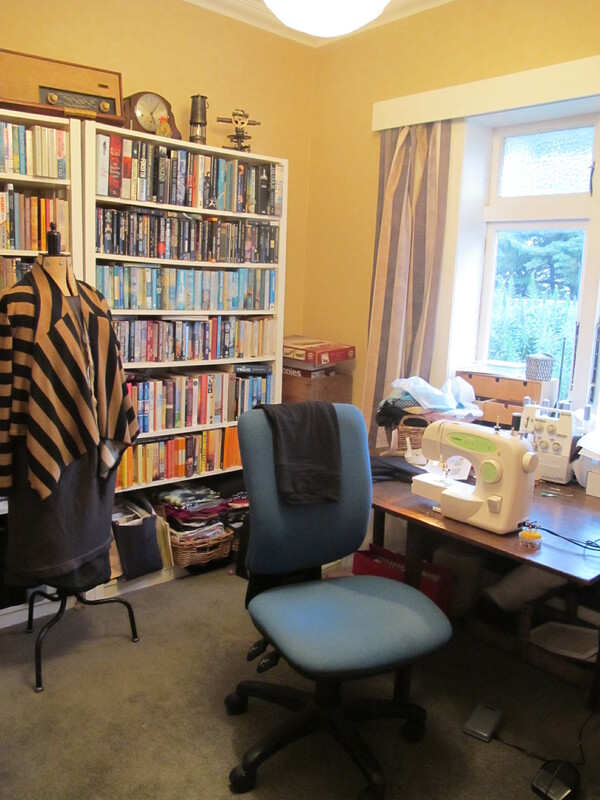 On it sit my sewing machine (Brother), overlocker (Toyota) and other heaps of randomness. Under the table and along the back wall are a number of old shopping carrier bags. I love these kinds of bags you get from clothing stores etc., to me they’re like little works of art. So mine tend to be re-purposed into storage containers (also helps to keep that shopping high going a little longer). The pink one at the bottom of the photo is used as my rubbish bin and others store scraps from old projects, projects that have been cut out in fits of enthusiasm but not started, interfacing and my new pattern tissue fabric. Plus the plastic supermarket bag contains the traced off pattern and various potential fabrics for the dreaded caftan for the mother-in-law. The bookcases were made by my husband to house the (in his opinion) excessive collection of books I brought with me when we moved in together. 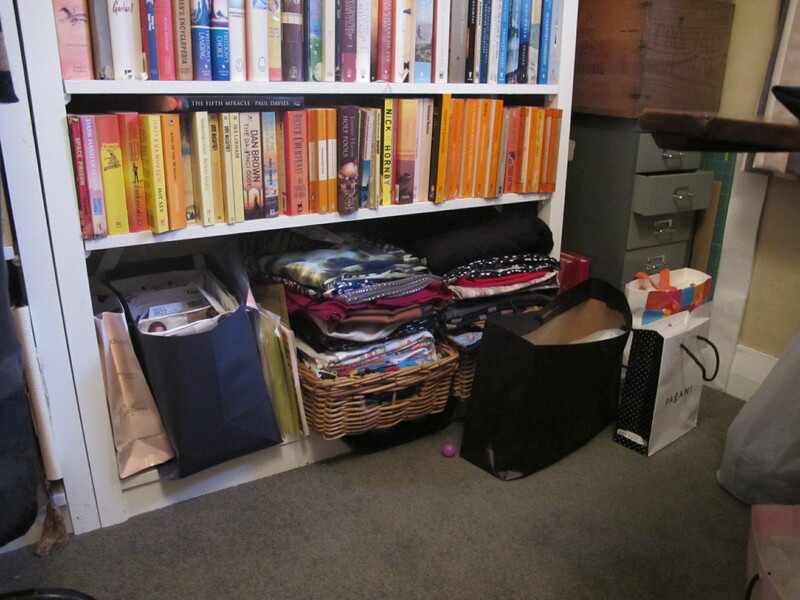 But the books outgrew the shelf space and migrated to more shelves in other parts of the house so I co-opted the bottom to house my patterns in the blue bag and newer stash acquisitions in the baskets. The yellow folders contain my latest thing, PDF patterns, which I only found out about this year – I know slow on the uptake. Proudly in front of the books is the “Dress form of Doom” still robed in her latest victims. On the bottom is an almost finished Nicola dress from Victory patterns, on top of that is my brown Coffee Date dress from Pattern Runway which is too small and my son said made me look like a slave, seriously, would you continue with a project after a comment like that? And on the very top is my striped cardigan. It’s made of an acrylic knit and I initially bought the fabric to use as a blanket at my old work cause the air conditioning was so random, then I decided to get creative and turn it into something. I like it but need to finish the edges and want to use leather/vinyl binding and I can’t find anywhere that supplies it despite seeing similar styles all winter with the exact binding I want. Actually I can find it online but am too cheap to fork out $5 per metre on an old “blanket”. Plus you know, buy local. On the other side of the table is my large metal trunk that holds the majority of my stash. 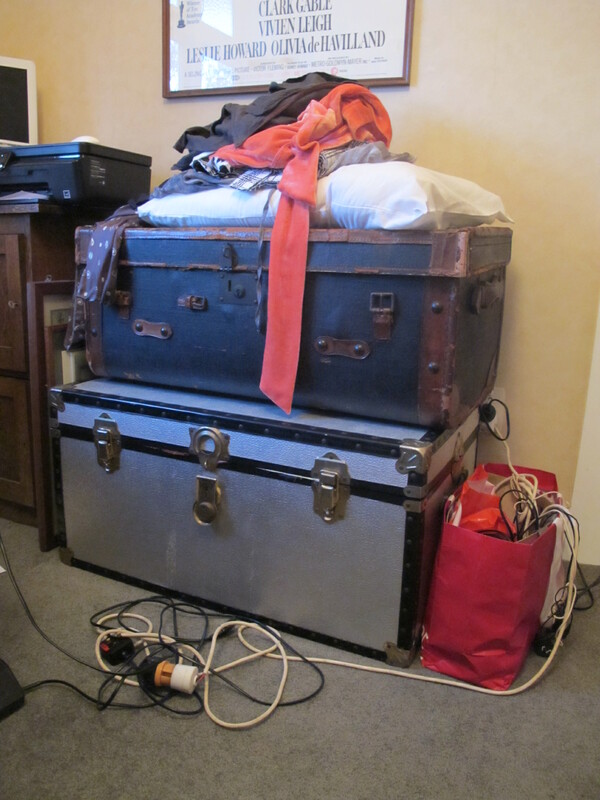 It’s a pain in the neck to get into with the other trunk on top (contents not sewing related). 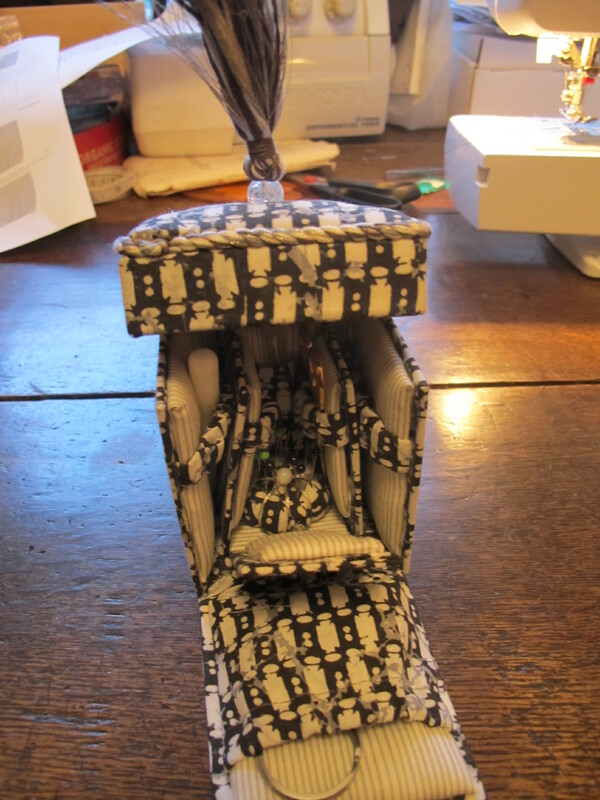 The trunk is completely stuffed full with fabric which is why I started using the baskets in the bookcase. (Confession time – the Arthur Toye spree that prompted me to finally get off my chuff and sew more hasn’t exactly been my only fabric purchasing trip this year, so many opportunities, so little resistance.) On top of the trunks is a pile of mending/alterations which sit in my eyeline while I’m sewing as a ‘gentle’ reminder of their existence. 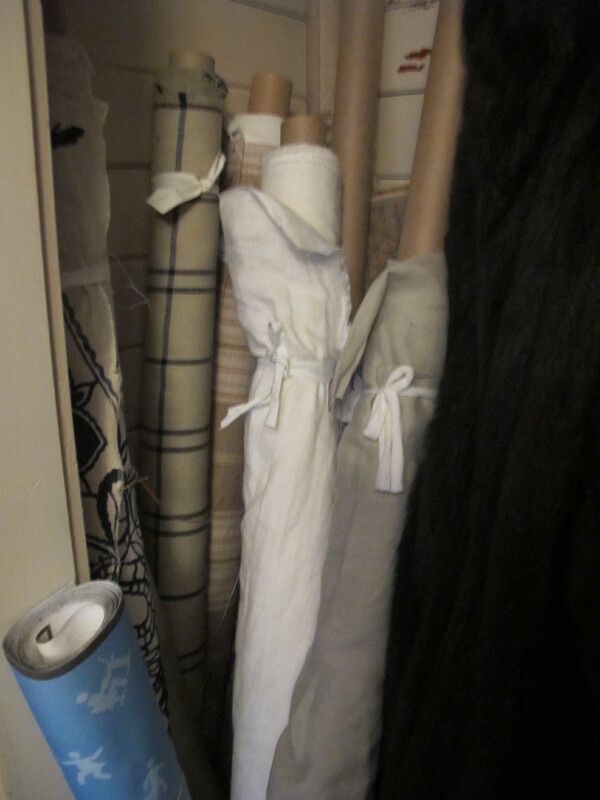 The last of my stash are the rolls of upholstery fabric in the cupboard in the wall opposite the desk. Rolls of beautiful fabric for curtains etc for the ‘next house’, there used to be more but I lost most of it in a fire at our storage unit earlier this year. Gemma asked what our favourite make is and mine is a cardigan I finished a few weeks ago and will blog about after this. What’s next on the sewing list for me? Well apart from the dreaded kaftan for the m-i-l, I have a few things cut out in those bags and probably another attempt at the Coffee Date dress but in a less slave like fabric. 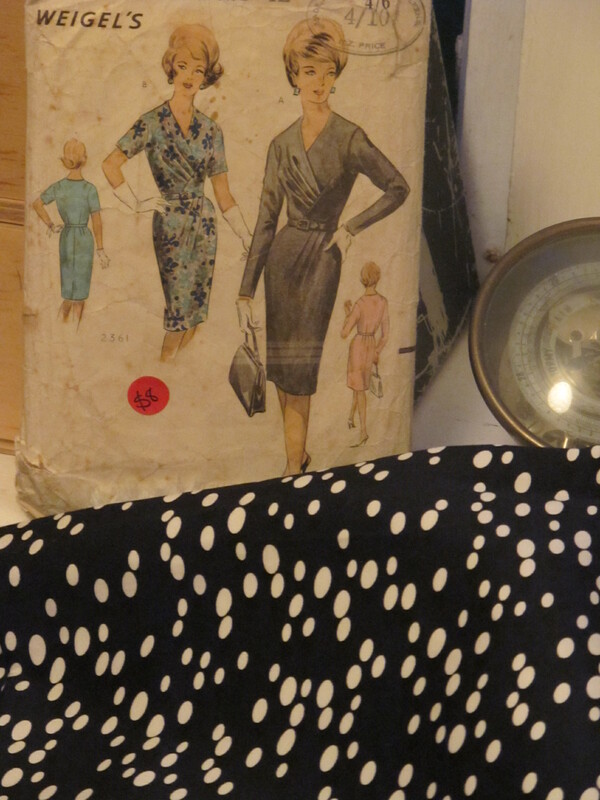 But what really inspires me is this pattern and fabric both acquired from Flossie FT, I’ve never made a vintage pattern before and this one looks soooo elegant. I think a proper muslin is on the cards. And my favourite sewing gadget? 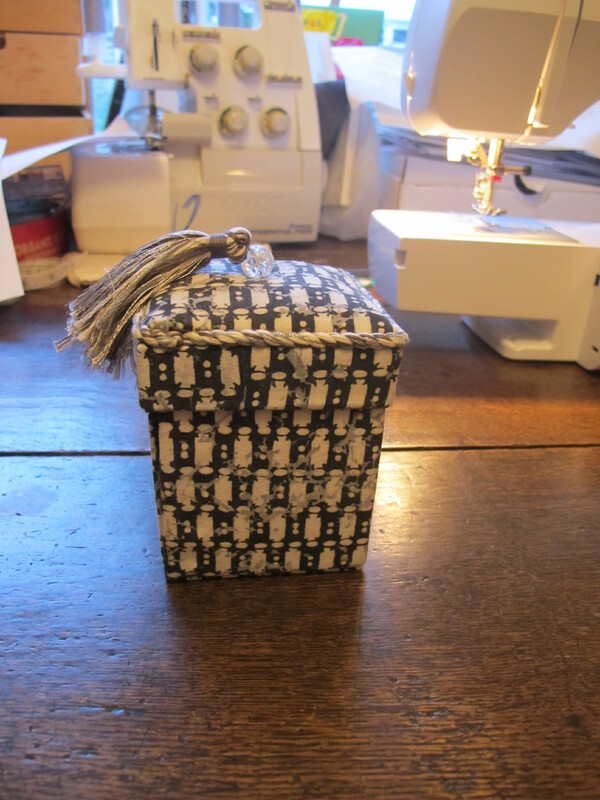 It’s my Victorian sewing box made by my Mum, it makes me happy every time I pull the top off. Hope you enjoyed the tour, if you haven’t already had a gawp round KiwiMel’s room go have a look and don’t forget to check out Flossie FT’s room tomorrow. Who’s afraid of the Big Bad Knit? 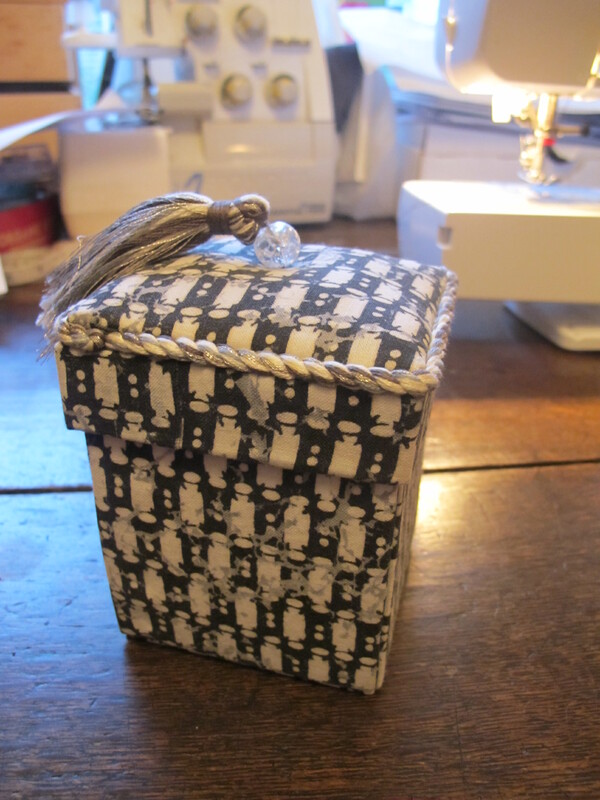 I love the sewing box. Many of my notions came from my mum – they’re always more special! Ohhhhh I love your room! you left Library off the list of things the room is … hehe BOOKS! I love BOOKS! Like a slave, what a cheeky kid! It’s sad to hear that you had a fire, how terrible. All my things were in a storage unit for two years, which backed directly on to a stationery factory, and I was always worried there might be a fire. That vintage pattern is stunning, I can’t wait to see it made up. 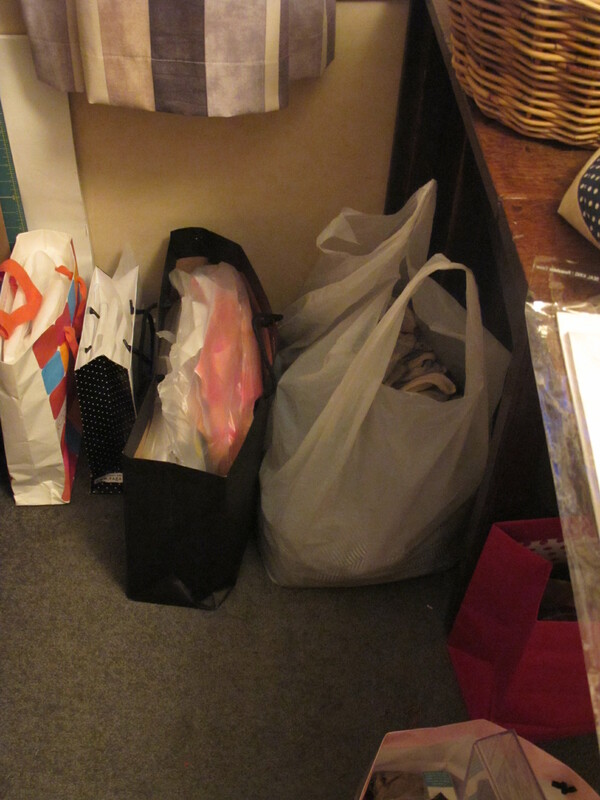 I use pretty shopping bags for storage too! 🙂 I think we’ll need a photo of the tiny ship yard sometime, that sounds hilarious, he doesn’t make you sew tiny sails though, right? I’m glad you got a blog and joined us, yay for peer pressure! I enjoyed this, thank you! 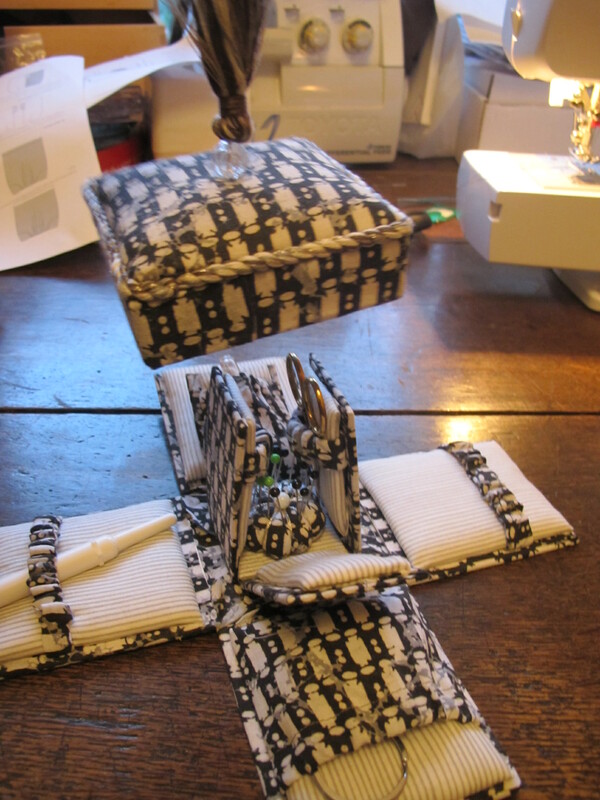 Your bookshelves are fantastic and your sewing box is just divine. I’m so sorry to hear about the fire too, I know you can restash but it doesn’t ease the loss.